Preheat the oven to 325°F. Lightly butter a 10-inch tube pan, then line the bottom with parchment paper. Alternately, you can use 2 8x4" loaf pans. Coat those pans with butter or cooking spray and then line with parchment paper. Place the butter, cream cheese, and sugar in the bowl of a stand mixer and beat on medium speed for 5 minutes. Add the eggs, one at a time, beating for 30 seconds after each addition and scraping down the sides of the bowl as needed. Whisk together the flour and salt in a medium bowl. With the mixer on low speed, add half of the flour mixture. Gradually increase speed to medium and beat for 30 seconds. Beat in the extracts. Add the remaining flour and beat on medium speed for 30 seconds. Scrape the bowl thoroughly. Pour the batter into the prepared pan(s) and shake lightly to even out the top. 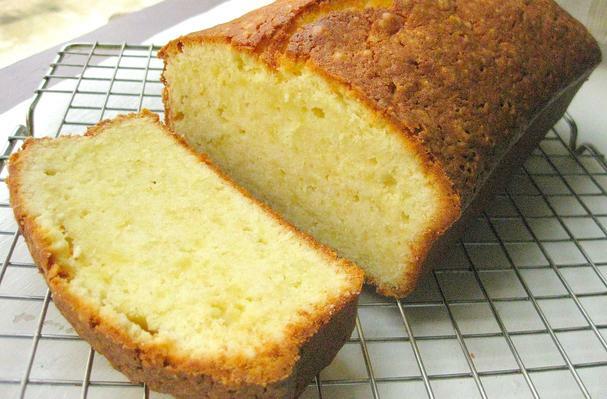 Bake until the cake is golden brown and a toothpick inserted in the cake comes out clean, 1 hour and 15 minutes. Place the pan(s) on a wire rack and cool for 10 minutes, then remove the cake from the pan and let it cool completely. Serve at room temperature.